Just got a shipment in from Santarem Discus, it just arrived about about 20 minutes ago. This has got to be the biggest shipment we’ve ever received from Santarem Discus. There are 62 boxes filled with 500 adult wild discus fish. It is about 10:30pm at night right now and the Jack Wattley Team is all here unpacking. We wanted to give you an idea of what 62 boxes of wild discus fish looks like. We are going to take you every step of the way so that you guys can get an idea of what a shipment like this looks like once it has arrived. There are only eight wild discus per box and these boxes are humongous! We pay extra in freight but the fish can actually handle the journey. Santarem Discus has had them, in the past, where they’ve been in the boxes for over 100 hours. This is a Blue Heckle, often called a Blue Moon Heckle. That is how they come directly from Santarem Discus. Something we’ve been doing for many years is, prior to shipping, Santarem Discus, will send me a text message telling me what the Ph and conductivity of the water so we will match it here two or three days before. So we’ve got the tanks running and ready. So basically we’re taking them from their water into their water again because everything matches identically. No, for example, Santarem will call me and they’ll say it’s 6.5 on the Ph and the conductivity is we’re not going to be around 250, so we’ll bring up the conductivity in the tanks a little and we’ll match the 6.5 rather than bring them up to 6.7. They are coming from a long trip and are a little bit stressed so we’ll add a little bit of salt and sometimes we’ll throw in depending on what they look like, a little bit of Aquaflavin because it helps avoid secondary bacterial infections in case they have any wounds or scratches from transit. Other than that, we do nothing else. We don’t feed them for two days so they can recoup so they can come around. Then on the third day is when we start feeding and then we usually keep them around for about a week or so to make sure that they’re okay before they even get shipped out. Now mind you, these fish have been in quarantine for two months already, so when the season opened up in Brazil, after capturing them, they put them through the procedure of de-worming them, getting them to eat pellet food or or a flake food. So basically these fish I’ve already gone through quarantine, which is what makes it so simple for the rest of us because once you get them their healthy as can be. Basically you want to keep it as as possible. You don’t want to be hitting them with heavy drugs or anything like that. Especially after such a stressful trip. You want to keep them a healthy, but at the same token, you don’t want to weaken their immune system. So we try not to hit on any medications or anything like that, salt and Aquaflavin usually does the trick. You guys will see videos later, how within minutes how much color they have. And it’s like I tell everybody within a week they’re popping colors like there’s no tomorrow. There’s many variations, but basically there are Heckles and Non Heckles. The Heckles are renowned because they have the big center bar and they’re very blue in color. The rest of the Wild Discus Fish come from different parts of the rivers. You’ve got Cuipeua, Mangals, Iripixi. Iripixi are usually very yellow, very large, like extremely large. Then there are Royals (Cuipeua Royals) in here as well. We don’t mind bringing in the best Wild Discus on earth directly to our clients. 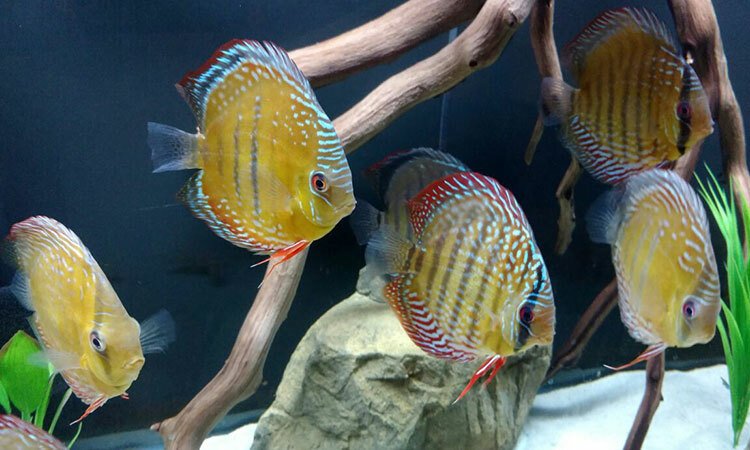 We can breed the Wild Discus, but we haven’t tried yet, but we probably will soon with the amount of wild discus we are bringing in.